Lately, I’ve really been on a sample-requesting kick. I like getting mail, and I like trying new things, so this works out really well! 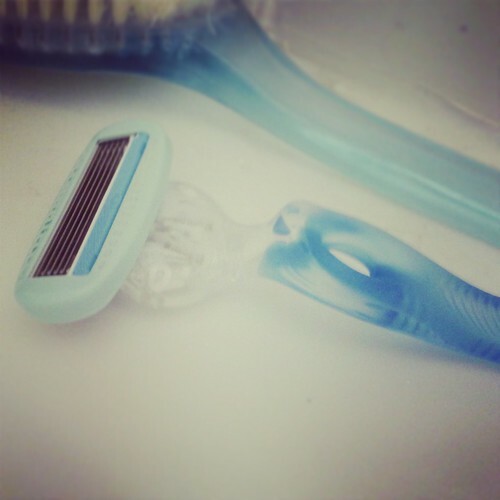 This week, I received a sample Schick Hydro Silk razor and I really looked forward to trying it out. I admit to going way too long between shaves, especially in the cold months. This time it had been 3 or 4 weeks and I was really due. Usually I use Schick disposable 4-blade razors. The Hydro Silk has 5 blades instead of 4, and it’s a more compact unit. The blade cartridge is more narrow and the blades are closer together. What this ended up meaning is that with my leg hairs as long as they were, it took me longer than it would have usually to get them all done. But the shave was also super super smooth. There also is some sort of moisturizing substance built in that really increases the smoothness of the shave. I had delightfully silky legs all day that I just kept wanting to touch. So this was a definite win! I think this would be best to use when I’m keeping up on my shaving and only have some stubble to remove. I would definitely purchase more blades for this but I will not be giving up my disposables either. They have always served me well and get the job done faster considering how much I let it go sometimes. This may become my new go-to for maintenance though. This entry was posted in bath and body and tagged body care, razor, review, schick, shave, shich hydro silk, things I like. « Salted Butter, how did I live without you?